Vegan Bytes #38- What's the Most Extreme Diet in the World? Vegan Bytes #38: What's The Most Extreme Diet in the World? *Question: "Can I feed my dog vegan dog food?" *Question: "Is SiteBuildIt Worth It?" What's the Most Extreme Diet in the World? There are hundreds of different diet plans on the market right now, and some people swear by one or another. I am not a huge fan of diets, and much prefer lifestyle changes where you have appropriate expectations and don't feel deprived. If you're reading this newsletter, you've probably read the free weight loss e-book I include as a free gift for signing up, so you know all about my philosophy on weight loss. What's funny is that last week US News and World Report issued their first ever ranking of diets, and guess which diet scored high? Yup, the vegan diet. Just like we've been saying all along. There were a few others on the list that follow something similar to a vegan diet as well, underscoring the fact that the basic concept works. I'm torn when I read these results. On one hand, it's what vegans have been promoting for years; a healthy vegan diet based on whole grains, vegetables, fruits, and legumes will help you lose weight. But, on the other hand, I fear people coming to veganism solely to lose weight. I find those are the people who struggle the most, and who are most likely to quit the "diet" within a few months. I have heard of plenty of people who learn about veganism for its weight loss potential and then find that they feel amazing eating this way, and they gradually begin to learn more about it, and those people I admire. But, I digress... We haven't yet talked about the most extreme diet in the world. Do you know what it is? Click here to learn what the extreme diet entails, and who's following the diet. You probably knew carrots were good for your eyes, but did you know they can also help prevent heart disease, lower your risk for cancers, even in one of the cancers that is notoriously developed through a dangerous activity... can you guess which one? 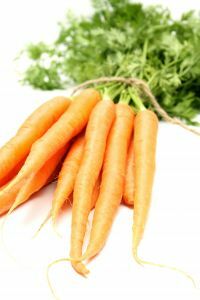 Click to learn about all the health benefits of carrots and a few of my favorite uses for the vegetable and its juice. Question: "Can I feed my dog a vegan diet?" 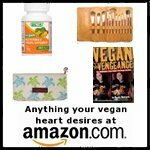 I have been researching a vegan dog food and wonder if you think it is healthy. I am vegan and it bothers me each time I put money toward the purchase of dog food. I posted a comment about turning my dog into a vegan dog on the Youtube site where Earthlings was shown, and surprisingly got the response that it would abuse to my dog to make her be a vegan dog. I do not want to cause harm to my dog's health but am really interested in knowing more about having a vegan diet for my dog. Are you feeding your dog vegan dog food, or are you wondering if you can switch over? Read to find out about vegan dog food. Question: Is SiteBuildIt Worth It?" People always ask me about my "job," and how I could possibly make money writing about what I love and helping people move into veganism. I have a few answers for that question, but I don't often get people asking directly about the tool I use to be able to make my site. Recently I got a question that inspired me. Stephanie sent me an email asking if my site building company (SBI!, or SiteSell, or SiteBuildIt) was worth it. I went on and on in my response to her, and that's when I knew it was something I should share with all of you. It wasn't long ago that I was working a regular 9-to-5 and hoping for a way to branch out on my own. I knew that I wanted to share veganism with people, but I had no idea how to do it. And then I read a few reviews about a website company that would allow you to take your passion and develop it into a full on business. If you're passionate about ANYTHING and are searching for a way to spend your working hours working on something you love, I definitely recommend you check out this link. This is our most recently created ebook, and it's been overwhelmingly successful. I've found it really difficult to find a vegan bread cookbook on the internet; there are tons of recipes out there, but they're scattered all over different sites and you never know which ones are good. This book has everything from an eggless brioche to a classic whole wheat boule recipe, so you'll never have to go scrounging the internet again. I'm so happy people have gotten so much out of this ebook. This time I asked for the help of several bread testers, so the recipes are flavor/texture/instruction-tested and approved! Learn more about the bread baking tip that's almost too easy here or download your copy for only $7.95 now. 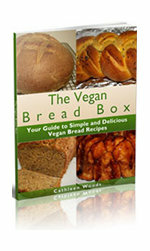 Very, very soon, hopefully by the time you are reading this newsletter, we will have the option of you buying The Vegan Bread Box at Amazon for your Kindle and on iTunes for your iPad or iPhone, as well as through Barnes and Noble and many of the other online reading resource centers. I am super excited about this option because I get a lot of people asking me about opening these ebooks on those devices, so I think this will open up the options for spreading the word about vegan recipes. If these links are not quite active, I encourage you to try again in a few days. It evidently takes a bit of time to get books listed and they've been in the queue for awhile, so it's right around the corner. Oh, and bonus! The listings on these readers are on a grand opening sale of $1 off... get yours (or a gift for someone) for just $6.99. To buy The Vegan Bread Box on Amazon. To buy The Vegan Bread Box on iTunes. 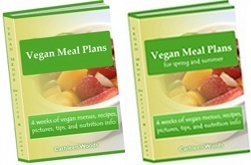 Get The Vegan Bread Box, A Fresh New Vegan You, Vegan Meal Plans and Vegan Meal Plans for Spring with a free copy of the massive Vegan Grocery List for only $49.95. Save 15%! Download this package here. *Note: this does not include Soak, Rinse, Boil! because you get it within A Fresh New Vegan You. I know that as a vegan or vegetarian you are likely inundated with hummus sandwiches at restaurants, and you probably also have your own favorite recipe at home. But, I just have to share this one with you. 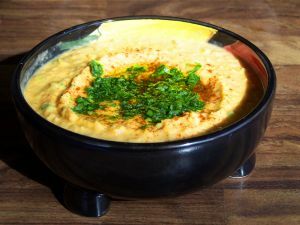 This hummus is based off of Dr. Neal Barnard's hummus in Food for Life, and it's made with no added oils, is incredibly simple, and is easy to bump up a notch with extra flavors. Here's a link to the basic hummus recipe. What I recommend is to make the basic recipe and then start experimenting with these flavor combinations. Remember the rule that it's always better to start with less and work your way up to more because you can always add more of something, but you can't take it out. For me, hummus is easiest to make with my Vitamix, but any strong blender or food processor will work well. Roast the garlic for 5 minutes before adding it to the recipe for a more intense garlic flavor. You can even double the number of cloves it calls for in the basic recipe. In honor of this month's spotlighted vegetable, consider throwing in 1 cup chopped carrots with your basic hummus recipe. Try sprinkling in a few spices that bring out the flavor of carrot hummus like parsley, coriander, and/or ginger. Roasted red pepper hummus is a classic. About 1/2 cup is enough to give the hummus zip, and a great accompanying herb is basil. Speaking of which, try a tomatoes and basil hummus by adding 1/2 cup sun-dried tomatoes to your basic recipe and throwing in fresh basil leaves until you have a nice summery dip. You can make a green hummus with either spinach, zucchini, or kale. Use 1/2 cup to 1 cup (start with less and work up to the flavor you like) and taste. Jalapeno hummus is a very popular style. Start with 1/4 cup and work your way up to the flavor intensity you like. Kalamata olives match really well with chickpeas as well, so try 1/4 cup pitted olives in your basic recipe. 1 small roasted eggplant is delicious in hummus, especially with a tiny bit more cumin and a sprig of parsley. Other amazing vegetables to add-in include: artichokes, sweet potatoes, chipotle peppers, or bell peppers. You can also make hummus with nuts such as pignoli, walnuts, hazelnuts, and almonds. Add in about 1 cup shelled and roasted nuts to your blender before you add the basic hummus recipe ingredients. And don't forget, a percentage of all Vegan Nutritionista profits go to a rotating group of charities that benefit animals. Last year, we donated to Vegan Outreach and to start off this year we donated to Physicians Committee for Responsible Medicine and PETA (for help rescuing animals after Japan's disasters.